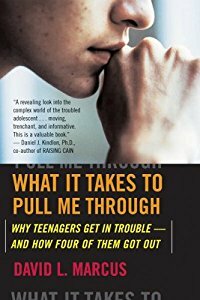 A Pulitzer Prize-winning writer untangles the mysteries of the teenage mind as he witnesses troubled kids transformed by fourteen months at a school that offers therapy for adolescents in crisis. David L. Marcus decided to show parents what goes on in their kids’ heads and on their computers. To find answers, Marcus gained unfettered access to students, staff, and parents at the Academy at Swift River in the hills of western Massachusetts. The kids at Swift River had already ventured down a number of perilous paths all parents fear their own children might take – drug use, violence, theft, internet addictions, eating disorders, promiscuity. Known for combining intensive academics, a wilderness program and group therapy, the school helps troubled teenagers emotional health. a once high-achieving Florida girl “broken” by the death of her mother. While uncovering what drove these kids and their parents to Swift River, Marcus opens the black box of the teenage mind. As he reveals the intense, dramatic process that sets (most of) these kids right, he weaves a taut, absorbing tale. And he charts a path to hope that any kid, any parent, whether or not in crisis, can take. David L. Marcus has been a foreign correspondent and education reporter for U.S. News & World Report, the Boston Globe, Miami Herald, and Dallas Morning News, where he shared a Pulitzer Prize for a series of articles on violence against women around the world. Marcus also was a Nieman Fellow at Harvard. After a twenty-four year career in journalism, he spent a year as a high school teacher at Deerfield Academy in Massachusetts. He was a visiting scholar at Ithaca College’s Park School of Communications. Then he joijned Newsday and reluctantly moved to Long Island, home of too many traffic jams. Most recently, Marcus authored ACCEPTANCE, a book about a extraordinary guidance counselor helping seven students get into college (Penguin Press).